EP Junior Pressure Sensitive Roll applicator. 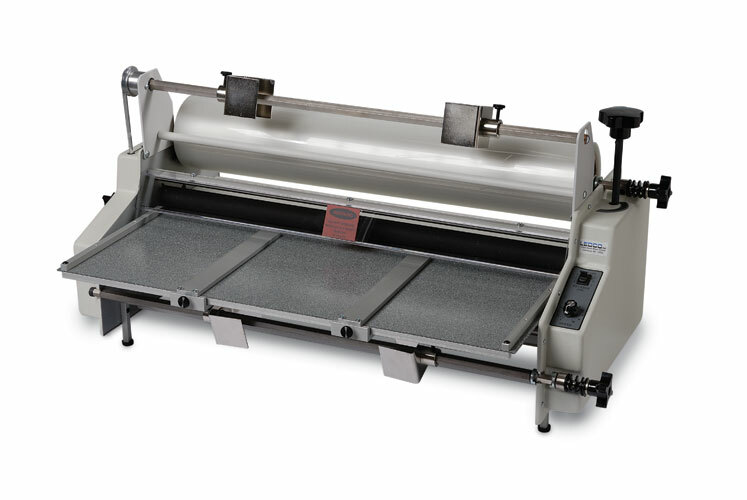 User friendly laminator to automate the application of transfer tape and other pressure sensitive adhesives (PSA, tapes or films), apply to any substrate up to 7/16" thick. Econocraft laminators automate the application of transfer tape, and other pressure-sensitive adhesive (PSA) tapes or films. They will apply background vinyl or PSA films to sign blanks. They will apply transfer-taped vinyl to any flat sign material, and will apply clear PSA overlaminate to finished signs or promotional materials. Econocraft applicators can be used to apply any type of pressure-sensitive film or tape to any substrate up to 7/16" inch thick. They can be used for mounting. Designed for sign and graphics applications, Econocraft machines are used in many settings, including sign shops, photo-finishing labs, reprographics shops and manufacturing plants. Jobs such as applying vinyl to sign blanks or putting transfer tape on vinyl signage are very labor intensive. As the material gets wider and longer, the labor costs become disproportionately high. Bubbles and wrinkles are introduced, and waste increases. Some jobs require the additional time and mess of liquid application. When signage is ruined during the taping or application process, the cost of recutting, reweeding, and reapplying will usually take all the profit out of a job. Whether it's transfer tape, vinyl, sandblast or acid resist tape, premask, adhesive film, clear polyester, or other pressure-sensitive material, an Econocraft applicator will put it down effortlessly with no bubbles or wrinkles. Using an Econocraft is much easier than doing the same work by hand. Fast and versatile, it requires little instruction for you to be up and running. Supply roll tension is controlled with knobs. The laminating roller gap is adjusted with a single knob. Econocraft applicators are forgiving. They will apply most materials under a wide range of speeds and pressure or tension settings. The 25 is a lighter duty model in size and construction. A scrap rewind with an adjustable clutch takes up the release liner found on many pressure sensitive films. Roller bearings, alloy construction and high quality motors insure a long and trouble-free life for these machines. Interchangeable rubber rollers help keep maintenance costs down. The supply roll tension knobs are important, because without some supply roll tension, most films and tapes will wrinkle during applications. A reverse drive switch makes it simple to back material out of the laminating rollers or correct material wrap-around. Manufactured in the U.S.A. means quality, better service and faster parts availability. Supply Roll Core Size 1"
Max. Film Roll Diameter 6"
Weight / Shipping Weight 46 lbs. / 57 lbs. A bottom supply roll assembly, an attached safety shield, and a feed tray with fixed left and right side guides and one moveable guide, are standard. 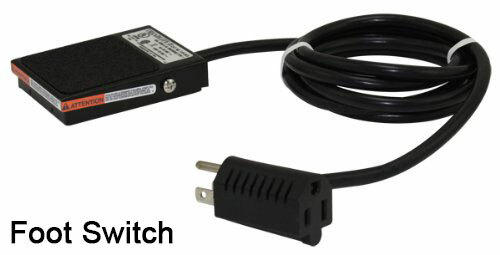 The foot switch and slitter attachment are optional items on the 25" model.